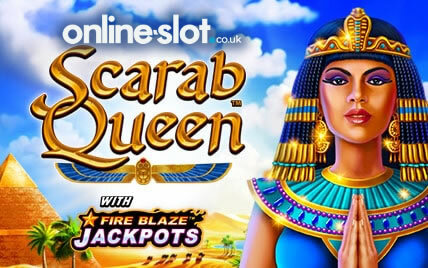 Embark on an Egyptian themed adventure in Scarab Queen – a 5 reel, 50 payline slot from Playtech. It comes with a Free Games feature with a wandering reel and a Fire Blaze Respin feature where you collect sun symbols to win 1 of 4 fixed jackpots – the Grand Jackpot is worth 2,000 times your total stake. Age of Egypt is a 5 reel, 20 payline slot from Playtech that can be played on all devices from 20p to £1,000 per spin. This ancient Egyptian themed offering comes with a pick me style bonus feature and a free spins feature where you can get unlimited free spins with a 3x multiplier. Visually, Age of Egypt is quite good – set in ancient Egypt, it has a sunset setting as you are on the Nile overlooking the pyramids. With a rhythmic, Arabian soundtrack playing as you spin the reels, symbols include A, K, Q, J and 10 playing cards, scarab beetles, Horus (the God of Sky and Kingship) and the Eye of Horus. The Anubis symbol is the bonus symbol – when you get 3 or more appears consecutively from reel 1 (i.e. reels 1, 2 and 3), you will trigger the Anubis Bonus feature. You then pick artefacts to reveal cash prizes – you will get 3, 4 or 5 picks depending on how many bonus symbols you got to activate the feature. The other symbol to look out for is the Pharaoh Queen which is the scatter – 3 or more anywhere on the reels will trigger the Royal Treasury Free Games feature. You will rewarded with 10 free spins with a 3x multiplier. 3 or more scatters appearing during a free spin will give you an extra 10 free spins – you can win an indefinite amount of free spins too. Finally, you can also trigger the Anubis Bonus feature as the bonus symbol appears during the free spins. Age of Egypt is a relatively simple ancient Egyptian themed slot – it would be good to have something different when it comes to this theme but it’s solid rather than spectacular. Variance wise it’s in the middle with the bigger wins coming in the free spins feature due to the trebling multiplier. I would recommend you try other similarly themed offerings with iSoftBet’s Eye of the Amulet and WMS’ Lady of Egypt good options.